Superchips Ltd, the world leader in performance ECU remapping, is delighted to announce a new remap release for the 275PS (271 bhp) Jaguar XF 3.0D V6S model. 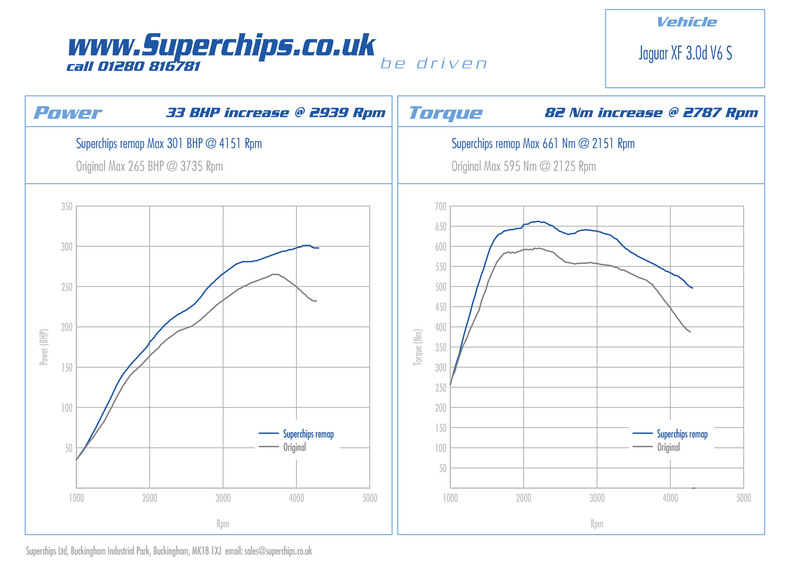 Developed using a mixture of in-house rolling road testing and real world driving assessment to ensure excllent response, driveability and reliability, the Superchips ECU remap for the Jaguar XF 3.0D V6 S model progressively increases the car’s power from just 1200 rpm upwards, resulting in a peak power gain of 33 bhp. Similarly, the Superchips ECU upgrade places a great emphasis on torque and tractability, posting an impressive 82 Nm gain at just 2787 rpm. Once installed, the Superchips ECU remap accentuating the sporting, yet effortless nature of the Jaguar XF 3.0D V6 S driving experience, enabling effortless fast cruising, overtaking and towing, whilst offering an exciting amount of additional urge at a readily affordable price. Crucially, independent testing of Superchips turbodiesel ECU remaps has proven that fuel economy gains of up to 7% are possible if the car is driven on a ‘like for like’ basis with the standard model, highlighting the extra efficiencies realised by the Superchips upgrade.